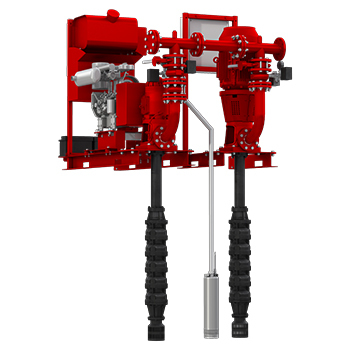 Fire-fighting sets with diesel engine or electric motor assembly, ideal for automatic sprinkler systems and/ or hydrants of commercial buildings, manufactured using vertical axial flow submersible pumps (vertical turbine pumps), in accordance with UNI EN 12845 (10.6.1) standard. Thanks to the submersible pump body and the motor assembly control above the surface, they eliminate any self-priming issues, in addition to making the job of the maintenance technician much easier. Modular design: DAB pressurisation sets are designed to be coupled with each other, in order to obtain all the versions and meet all the requirements of the UNI EN 12845 standard.